An Action Packed Tennis Event For The Entire Family! 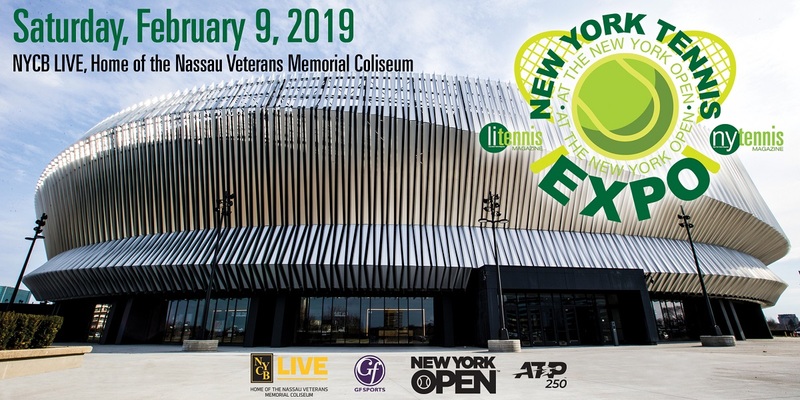 United Sports Publications (USP), publisher of Long Island and New York Tennis Magazines, is excited to announce the return of the New York Tennis Expo, the free and family-friendly event which will be held on Saturday, February 9, 2019 from 10:30 a.m. - 4:30 p.m. at NYCB Live, home of the Nassau Veteran’s Memorial Coliseum in Uniondale, N.Y.
Held in conjunction with the New York Open, which will run from Saturday, February 9 through Sunday, February 17, the New York Tennis Expo is the ultimate event for all things tennis. As the largest free grassroots tennis event in the United States, the New York Tennis Expo will have something for everyone in the family, and is now exclusive to just tennis fans! Extensive exhibitor hall with a vast array of companies, programs and products ranging from tennis equipment, camps, product sampling and much more. On-court tennis activities for all ages and levels including hitting for prizes and free tennis clinics provided by local college programs and top tennis coaches. Andy Roddick will be on-site signing autographs, and take part in a meet & greet session. Attendees will also be able to take part in a meet & greet with Harrison, Johnson and Bollettieri. A Kids’ Zone featuring a bouncy house, face-painting, 10-and-Under Tennis courts, carnival games and much more. Visit 2019NYTennisExpo.EventBrite.com to sign-up and receive FREE parking. ATTENDEES: CLICK HERE TO PRE-REGISTER WITH FREE PARKING! SPONSORS/EXHIBITORS: CLICK HERE FOR MORE INFORMATION! Sign up here for 2019 New York Tennis Expo Update E-Mails with the latest on Expo events, appearances, exhibitors and sponsors!